There are some problems installing updates, but we’ll try again later. If you keep seeing this and want to search the web or contact support for information, this may help – (0x80246017). Two options are provided, one is “Retry” which keeps repeating the error after trying, and another is “Advanced options” which allows user to configure how updates and preview builds are installed, and other options such as speed of getting new builds, branch of preview builds and whether to include other Microsoft products. None of it is related to the 0x80246017 error though. 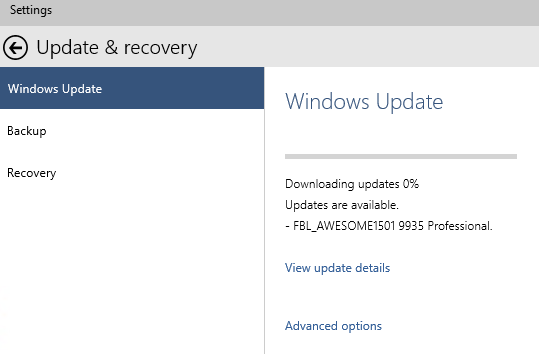 In fact, just before the error is shown, Windows Update shows the updates are available and is attempting to download and install FBL_AWESOME1501 9935 Professional (depending on what’s the latest build in the branch, the build number for Windows 10 can be ranging from 9931, 9932, 9933, 9934, 9935, 9936 and so on). According to Microsoft, the error is caused by a major rollup update KB3035129 which was released on January 29th, 2015. The update included a code change which unintentionally had the side effect of changing targeting for builds and accidentally exposed to Windows Insiders an interface that is not supposed to be shown, allowing builds that are exclusive to Microsoft employees to be offered. But as the public users do not have access to Microsoft internal servers, they are not able to download such preview builds, hence the error code 0x80246017. Microsoft promised a fix to correct this error and hide this interface is on its way, so you can just ignore the error if you can live with it. The error does not hinder the ability of the system to receive and install other legitimate updates and preview builds. If you want to fix the error, as in hide any preview builds that are internal to Microsoft only and not offered to public yet, modify the following registry keys so that the public update servers will target and offer newer builds as they become publicly available for Windows Insiders, but not any internal Microsoft builds. According to Microsoft, these registry keys should have been updated by a Windows Update, but apparently not. Make sure that the following values have the appropriate value date. If not change accordingly. The keys of concern here are “ThresholdInternal” and “ThresholdRiskLevel”. ThresholdOptedIn REG_SZ 0x00000001 (if you prefer to get builds faster) or 0x00000000 (if you prefer to get builds slower). This key can be deleted as Windows 10 will automatically set a new one based on selection in “Windows Update” -> “Advanced options”, with initial value as “Slow”. Once the change is made, check for update in Windows Update again, and no new builds should now be available and hence, no error too.